At the University of Nottingham Ningbo. When first witnessing quite a few African people gathering at the gate of one large Catholic church in Guangzhou for services in 2009, I was amazed that the Africans have to some extent formed their community in China’s southern economic centre. Where are they from? Why they went there? And what do they do for a living? How do they relate to local Chinese people? These questions lead to this blog. In fact, well before 2009, since the late 1990s, when China set to further engage in marketization reform and started to open its domestic economy to the world, African businessmen and traders commenced to move to Guangzhou. The 1997 Asian Financial Crisis further facilitated the process. By the end of the 2000s, tens of thousands of African business people were trading in the city. Now, 5 years after my last trip to Guangzhou, the African community has grown even larger and become more vibrant. They have increasing influence on the economic development and social life of local area, which is evidenced by the emerging ‘African towns’ in Guangzhou’s central area, such as Xiaobei Road and Dengfeng street etc. According to a number of statistical reports and research literature, the population of local African community is estimated around 150-200,000 making it the largest African community in Asia. The West Africans from Mali, Guinea and Nigeria are among the first to move to Guangzhou, but recent years have witnessed a surge in population from other parts of the African continent, especially east and southeast African countries, migrating to Guangzhou. In the Xiaobei Road and Dengfeng Street, most stores and eateries have their names labelled in not only Chinese but also in at least one language used by the migrated African people (such as English, French and/or Portuguese etc.). Like what the existing rural migrant workers do for their fellow townsmen, the existing African people also help new comers from Africa settle in and adapt to local Chinese business and living environment. As mentioned above, many of the new African settlers will be doing trade in Guangzhou, purchasing goods such as garments or electronics in bulk at wholesale price, and then shipping them via containers to Africa for sale there. The reason why Guangzhou is attractive to African business dealers is that it has a very close proximity to manufacturing factories, which keeps the wholesale price low. 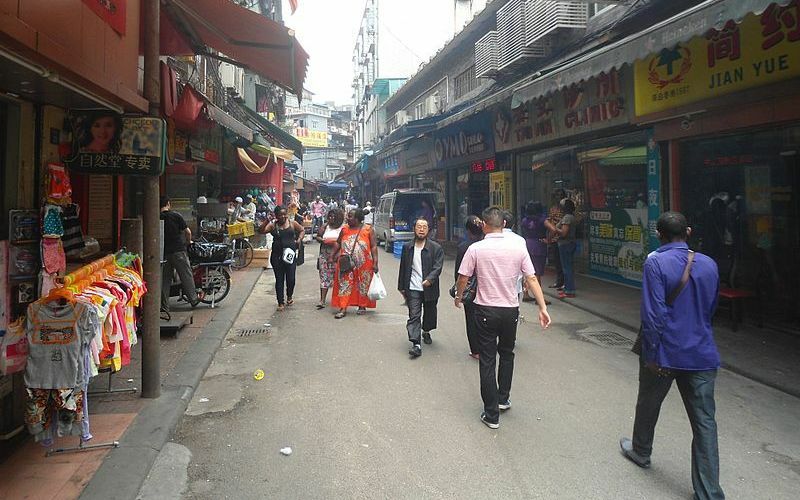 Thus, for these African migrants, Guangzhou is an ideal place to earn more profits and explore business prospects. Through doing trade with local businesses, the Africans contribute to the local economic growth. Meanwhile the rising African community allows Guangzhou to become a more internationalized city. Nevertheless, the growth of African community also adds pressure to local residents and government social administration. The significant differences in language and cultural customs make it quite challenging for African settlers to communicate with local residents effectively, causing troubles in mutual understanding. In addition, some of the African settlers are without legal residence permit and some do commit crimes. Local authorities have already taken measures to handle these problems. As interconnections between China and African economy grow stronger, it is anticipated that more and more Africans are coming to China for various sorts of opportunities. Integrating immigrants from different cultures is a new issue faced by Chinese governing bodies, and hence remains a great challenge. It will therefore take much more communication and understanding to work out an inclusive social system. Nonetheless, the construction of the system is of importance for governing any emerging foreign ethnic community, such as Africans, in China.